Feeding sugar syrup can supplement a colony's honey stores to prevent the bees from starving. Feeding can also stimulate the colony to increase egg laying, so a colony can have more bees gathering nectar during the main nectar flow. To prevent starvation, it is best for the bees to fill a lot of comb with syrup quickly so the colony is not stimulated to raise more brood. We also want the syrup thick or "heavy". A 1:1 ratio of water to dry granulated sugar works well. A top feeder (right) delivers syrup fast, and can hold several gallons of syrup. The bees walk up at one end. A screen over the dam and down to the bottom of the pan prevents bees from drowning. The cover must fit on snugly on top to prevent robbing of the feed from other colonies. 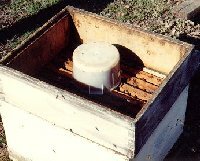 "Boardman" or frame feeders that fit inside the hive in place of frames also work well for delivering syrup, with grass, sticks or other floating objects inside the feeder to prevent bees from drowning. 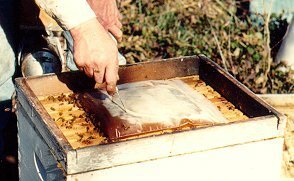 When feeding syrup by any method, care must be taken not to drip syrup or over-fill a feeder, as that may entice bees from neighboring colonies to rob the syrup and could cause the colony being fed to lose all its syrup and honey. 1. In a one quart ( or larger) microwave dish, mix thoroughly one and a half cups granulated sugar and one-half cup light corn syrup ( 3:1 ratio). No water. 2. Microwave on a high setting, stirring every few minutes, until the mixture is clear and bubbles become larger (thumbnail size), about 10 minutes. Bubbles should be large, but is stop immediately if the mixture starts to brown. A wooden spoon is very effective for stirring, as it can be left in the dish during microwave cooking. 3. Pour into a mold made from cardboard or a container lined with paper to cool. The candy will become brittle, and can be slipped on top of frames or between in a hive, where the bees will consume it. 1. Heat one pint (1/2 liter) of water to boiling in a large pot on stove. 2. Stir in as much sugar as can be dissolved. This will be about 5 pounds (2 Kg). More sugar is better. 3. Boil, uncovered, stirring almost constantly until the mixture reaches 234 degrees F. It takes awhile. 4. Pour into molds made of cardboard or a container lined with waxed paper or butcher paper. The candy will harden as it cools. Basically, any peanut brittle recipe can be adapted to make bee candy. I once tried to add some honey to a sugar candy recipe and it turned into a taffy consistency instead of brittle. The bees ate it eagerly, but it was hard to deliver in the hives. Granulated sugar is another good way to feed bees without overly-stimulating brood-rearing. Bees will eat the granulated sugar only if they don't have enough honey. 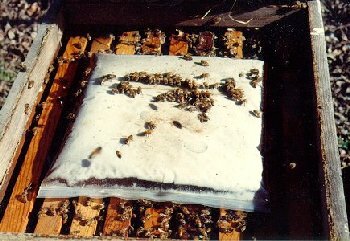 Sugar crystals can be poured on an inner cover or onto a thin board between supers above the bees. If granulated sugar is poured inside the hive, sometimes the bees will carry it out of the hive and throw it away. To stimulate a colony to grow more bees, it is best to feed continuously over several weeks. The feed does not need to be consumed very quickly. The syrup can be lighter too, with a 2:1 ratio of water to dry sugar. The ratio of water to dry sugar does not need to be exact. However, syrup ferments faster when there it contains a lot of water, and when the weather is hot. An inverted pail feeder works well, with the number of holes in the pail determining the rate that the syrup is consumed. The feeder pail is placed on top of the frame top-bars with an empty super or hive body and cover around the pail. A zip-lock plastic bag makes a good feeder. The bag of feed is placed on top of the frames. the middle of the top of the bag is sliced with a razor or sharp knife. The slit allows the bees to drink without drowning. A feeder ring holds the hive cover a few inches above the hive body. Old hive bodies cut in two or three inch rings make great feeder rings. The rate of feeding is influenced by the length or number of slits made in the plastic bag. The bees often line up like cattle at a feeding trough! A one gallon bag only holds about a half gallon of feed. I sometimes refill the bags through the slits. I have found this feeder helpful to increase queen acceptance when requeening. The downside is the expense of the bag, and disposing of it later.